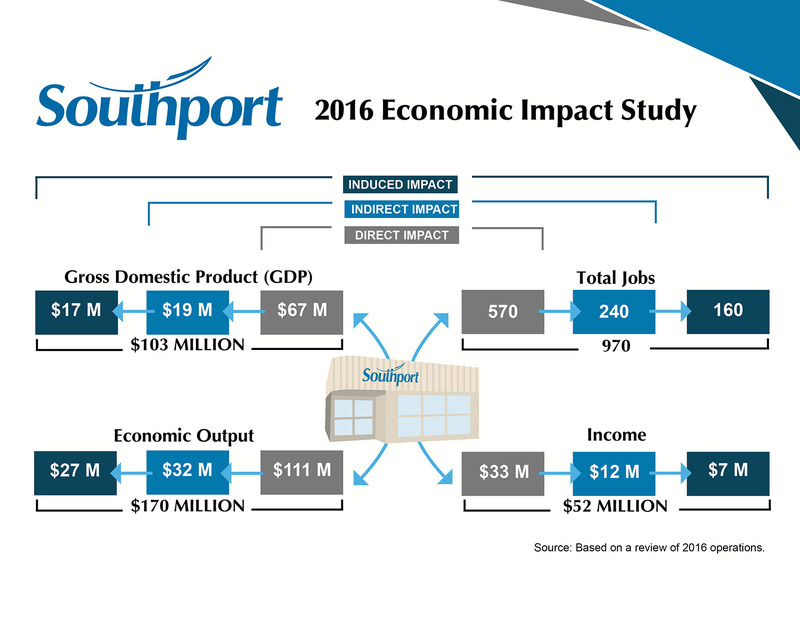 In February 2017, Southport released an economic impact study that measured the spending, employment and economic output of Southport through an analysis of 2016 operations. The report was undertaken to update the previous economic impact study of 2012, as significant changes have occurred at Southport since then. The new report examines the direct, indirect and induced impact of Southport, which highlights how the impact can ripple through the local and provincial economy. Direct impact is the effect of Southport and businesses located at Southport while indirect impact refers to the businesses that supply and support Southport. Induced impact is a measure of the spending of the direct and indirect employees in the general economy. The results of the study indicated that Southport and Southport-related businesses directly contribute 570 jobs, (540 full-time equivalents) $33 million in income, $67 million in gross domestic product (GDP) and $111 million in economic output on an annual basis. Looking at these results alone indicates that Southport has a significant impact on the surrounding economy. However, an even bigger picture is revealed by comparing these numbers to the previous study, conducted in 2012. Since the last study, Southport increased in every category assessed by the report. Economic impact surged up by $11 million, GDP expanded by $17 million, income increased by $3 million, and 30 new jobs were added. A portion of this increase is due to general steady growth in Southport-related businesses, but is considerably affected by new tenants at Southport. In the last year, Southport opened the newly renovated Central Plains RecPlex, along with the addition of two new tenants: Sawmill Tea + Coffee Co. and Portage Day Care Centre. These new additions to Southport contributed to the overall growth as well as creating new jobs. Another difference in the new study was that it also examined the specific impact of military flight training at Southport. The report found that a significant portion of Southport’s economic impact stems from the RCAF program and its related services. For example, 350 of 570 jobs at Southport are related to military flight training and its services. In addition, the program contributes $22 million in income, $48 million of GDP, and $70 million in economic output. While some might find the numbers interesting, others night be curious of the benefit of calculating the specific dollar amount of economic impact. This article was originally published in the 2017 edition of Southport's magazine, Reaching New Heights. View the digital magazine here.